The system is interesting, but the star of the show is the gun and its innovative ammunition. The ammunition is “Case Telescoped” meaning that the shell is embedded in the casing and surrounded by the propellent. The gun and its ammunition are products of CTA International, an equal-shares joint venture company between defence companies Nexter (France) and BAE Systems. The resulting round is very short and shaped like a cylinder rather than the typical double tapered shape of most fixed (one piece) ammunition. The short length of the ammunition means that the portion of the gun inside the mount can be very compact. In the illustration below, the 25mm M242 Bushmaster used in the Mk38 mount is at top right and the Case Telescoped (CT) 40mm is at the bottom right. It’s very compact breech mechanism is apparent. 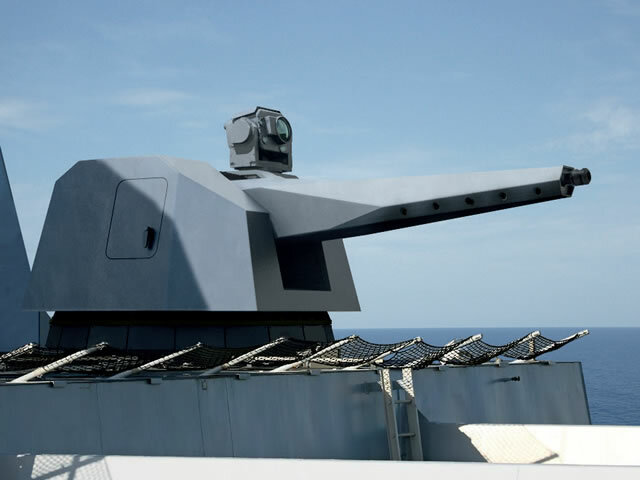 If this gun could replace our 25mm guns on the Webber class WPCs and the Offshore Patrol Cutters, either by replacing the mount or perhaps by replacing the gun in the Mk38 mod2/3 mounts (also a BAE product), it would give us improvements in range, accuracy, impact, and particularly penetration. Rates of fire for the two systems are the same. The effective range of the Mk38 has been variously reported as 2500 or 3000 yards. This has been a matter of concern to me because when approaching a suspicious vessel that might be being used to make a terrorist attack, I believe a cutter should remain at a distance such that improvised armaments cannot target specific critical equipment on the cutter (like its one gun mount). Improvised armaments might include heavy machine guns, anti-tank guided missiles, or Soviet era anti-aircraft or anti-tank guns of up to 130mm. From my observations and research, in order to preclude targeting critical systems, the cutter should initially approach no closer than 4,000 yards while its boarding party investigates. . The NavyRecognition post reports a claim of 4,000 meters (4,373 yards) for CTA’s 40mm. While I have not been able to find a claimed max range for the CTA 40mm, the maximum range for the ballistically similar Bofors 40mm/70 is 13,675 yards (12,500 m). The M242 25mm used in the current Mk38 mod2 has a max range of 7,450 yards (6,800 m). Assuming the effective range is proportional to the maximum range, the CTA 40mm should be able to effectively engage from beyond 4000 yards (3,659m). The image below, from thinkdefence, shows a comparison of effectiveness against armor using armor piercing fin stabilized fin stabilized discarding sabot (APFSDS) rounds. To me, greater armor penetration translates into being able to penetrate the hull and go on to wreck a larger diesel engine than the smaller round. As far as I can tell, while there is an armor piercing fin stabilized discarding sabot (APFSDS) round for the 25mm, the Mk110 57mm has no round comparable to the APFSDS round offered for the CT 40mm, which has a muzzle velocity of 1,640 meters/second or approximately 5,379 feet/second. The 57mm round would explode shortly after penetrating the skin of the ship, likely before it reached the engine. Because the 40mm round is about twice as big as the 25mm round, its effective radius is considerably larger. 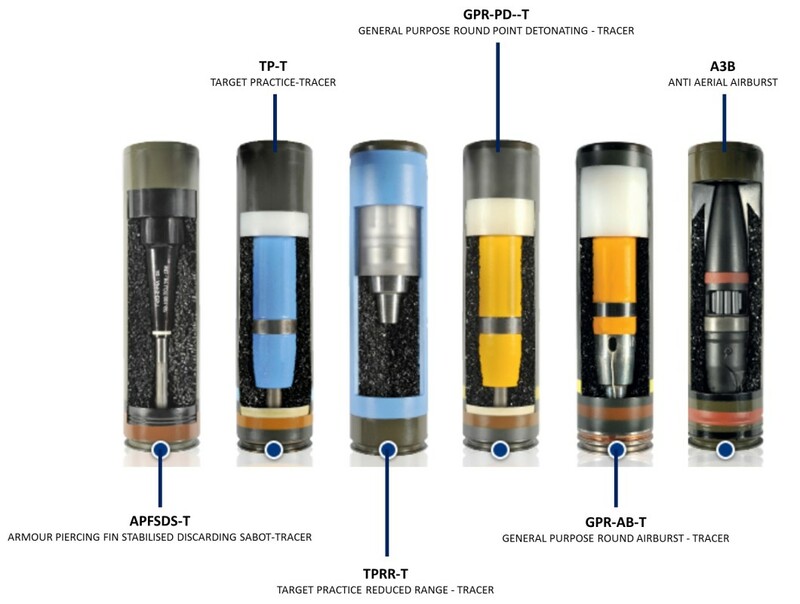 The image below (also from Thinkdefence) shows a fragmentation comparison between a 30mm airburst round (left) and the 40mm GPR-AB (40mm airburst). The lethal area for the airburst nature at 1,500m is 125m2. Apparently there is no airburst projectile for the 25mm because it is considered to small to be effective. Our friend at thinkdefence.co.uk has done an extensive examination of the development of this weapon. The gun has been adopted by the British Army for installation on two types of armored vehicles and the French are also planning on using it in one of their armored vehicles. Apparently the gun is a success and will probably find additional application, including, hopefully, a version of the Mk38. This entry was posted in Uncategorized and tagged FRC, OPC, Weapons, Webber Class, WPC by Chuck Hill. Bookmark the permalink. Canada needs to look at something like this for their patrol vessels. They took the 40mm Bofors off the Kingstons. They are planning on putting Mk38 mod2 on their Arctic Offshore Patrol Ships. Is the projectile 40mm or is it the case? Guns are usually rated by bore size. The trend toward smaller guns will only lead to a trend of larger guns.